This feature was first published in The Great Outdoors magazine, February 2017. Bothies in Scotland all have their own unique character. There’s Corrour, the one with the composting toilet; Kearvaig, the farthest north; Shenavall, the legendary one; the Lookout, where you can watch whales out at sea. And then there’s Ben Alder Cottage, the haunted one. 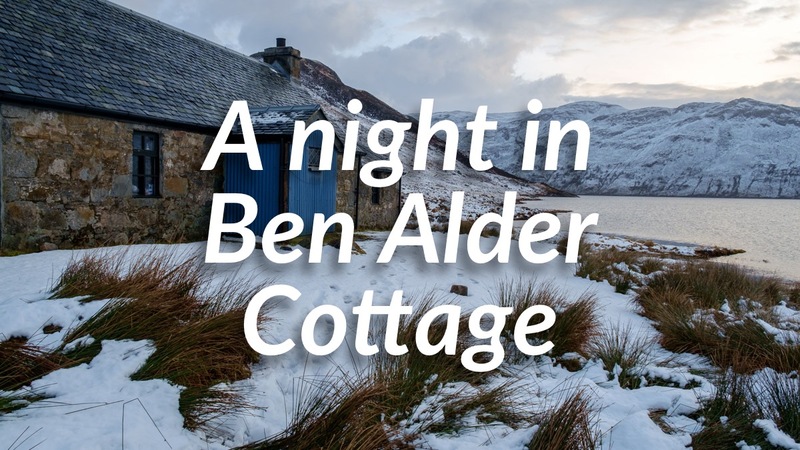 I’d long wanted to visit Ben Alder Cottage. It’s a remote bothy by the standards of the Central Highlands, concealed beneath the bulk of Ben Alder on the shores of Loch Ericht. Over the last few years I’ve come to love this area. It may not be one of the wildest places, but there’s so much space in this wedge of landscape between Kinlochleven and Dalwhinnie that you could spend a decade exploring it. My opportunity for a Ben Alder Cottage foray came after a dump of snow. With an iffy forecast and a big question mark over conditions underfoot, I booked a train ticket to Corrour Station and packed my snow shoes. I was excited, but at the same time I felt a frisson of nerves. What would I find at the haunted bothy? I’m used to a gradual transition between everyday life and the mountains. There’s a train, maybe a bus, then a hostel, then a walk-in to the hills. But this time I stepped from a warm train carriage directly into a snowstorm on the platform at Corrour, the highest mainline train station in Scotland. The train roared off into the night and left me alone. I staggered into the platform shelter and watched as fat snowflakes blasted past, illuminated briefly in the glare of a lamp post. Beyond that pool of light, the darkness was absolute. I like walking at night, I like snow, and I’m no stranger to solitude. But I felt more than a little unnerved by this jarring change in my environment. My plan had been to walk a couple of miles down the track and find somewhere to camp beside Loch Ossian, but as I huddled in the little shelter and watched the snow build up outside I could think of nothing more unpleasant. Cold as it was, I decided to stay put for the night. 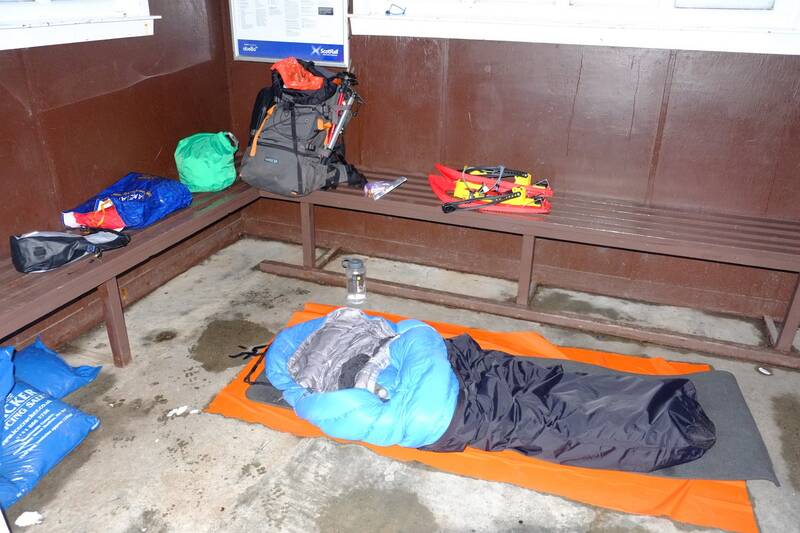 I spread out my sleeping bag and roll mat as far back from the open entrance as I could, and dozed uneasily until the platform lights went out. 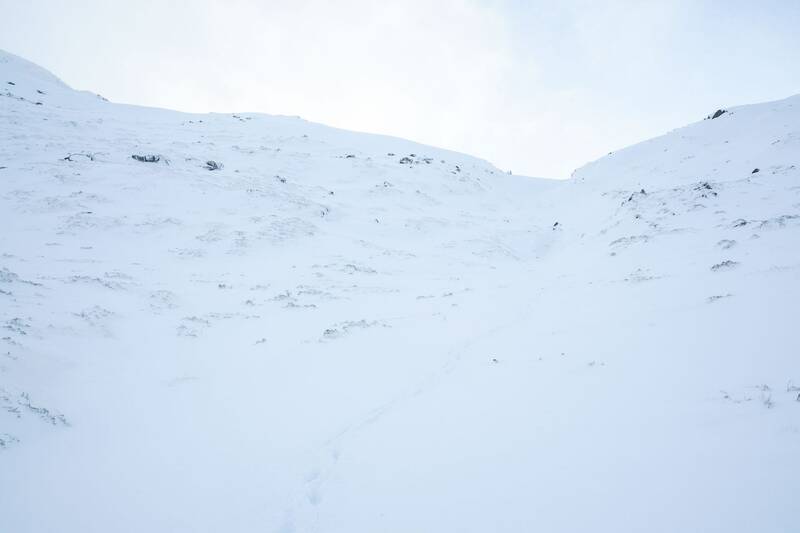 Route notes: Challenging navigation and steep ground on the descent to the bothy make this route a little more serious in winter than you might expect. Ice axe and crampons are required in snowy conditions. 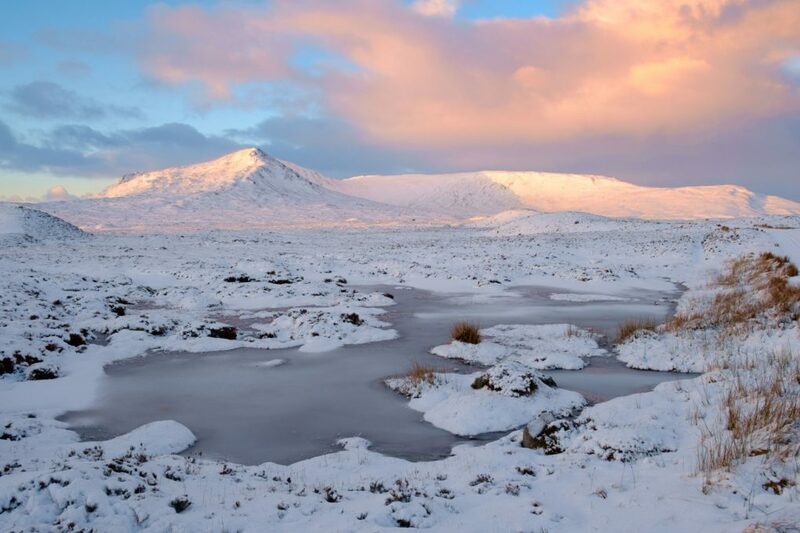 In stag stalking season, contact the Ben Alder Estate on 01540 672 000 to enquire about bothy access. Everything was different the next morning. The skies had cleared and a deep, penetrating cold settled over the fallen snow. I crossed the railway line and started walking east, while behind me the first blush of dawn illuminated the mountains. This is a strange place. It feels like it should be one of the remotest locations in Scotland, perched on the northern edge of Rannoch Moor, yet there is a railway line, a station house, hill tracks leading into the Corrour Estate, and even a youth hostel beside the loch. My pace increased as I tried to put these human elements of the landscape behind me. Climbing above Loch Ossian gave me the perspective I was looking for. Delicate light danced over the waters, and those hill tracks looked a lot less intrusive from a couple of hundred metres up. 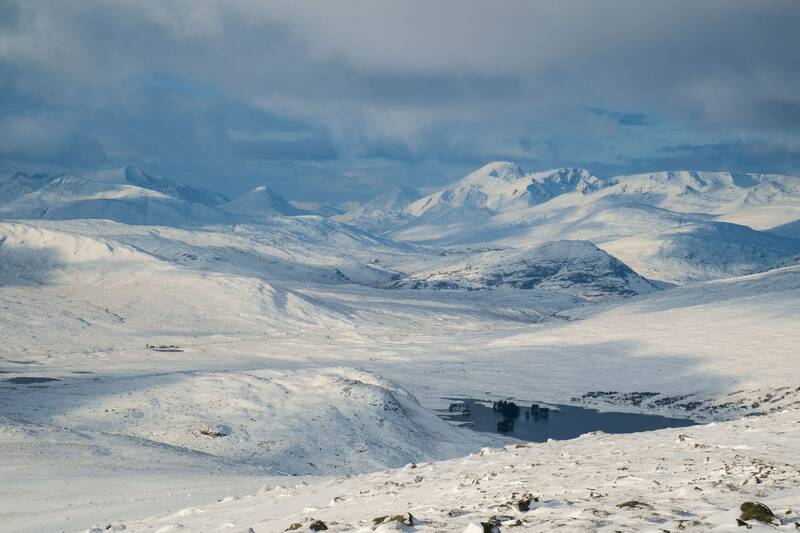 Views started to unfold over Rannoch Moor to the south, where I caught glimpses of sparkling lochans and distant peaks, all slumbering beneath a blanket of new snow. Nothing moved out there. My attention turned back to the task at hand, which was to climb my first Munro of the day: Carn Dearg. I’m not a dedicated Munroist. I’ve been chipping away at the list of Munros for more than a decade now, but I haven’t yet broken into triple figures. When I visit somewhere new, I’ll climb the mountains that look interesting and leave all the others for another day. 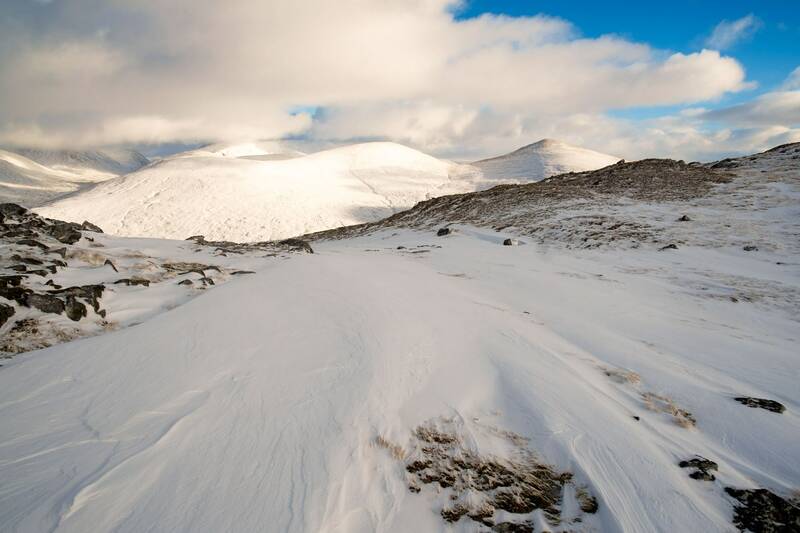 So why climb Carn Dearg? It’s a mountain on its way to somewhere. If there’s one thing I like better than a well-formed, rocky summit, it’s a mountain I can traverse from A to B with my big pack on. And the Ben Alder region is perfect for missions like this. Did you know that I send out weekly newsletters on adventure, writing, and adventure writing? Subscribe here to receive my Pinnacle Newsletter. The snow started to get deep and I wondered if I’d need my snow shoes, lashed to the back of my rucksack with shock cord. But soon the gentle western flank of Carn Dearg changed to a far more shapely ridge that curved right and rose over rocky ground to the summit beyond. Spindrift danced over slopes where rime ice traced crazy patterns on boulders. In between, the wind had carved the most delicate waves of sastrugi into the drifts of powder snow, and I found myself avoiding these areas, reluctant to destroy such ephemeral beauty. I didn’t spend long at the summit cairn – it was bitterly cold up there. The views improved as soon as I dropped down the east ridge towards my next Munro. Once again that sense of limitless space really hit me. The mountains in this area are not the highest or the steepest, but the vast spaces in between emphasise every inch of their stature. It’s a landscape of grand proportions, big skies, and huge, sweeping lines. The connecting ridge between Carn Dearg and Sgor Gaibhre looked gentle on the map, but I found a few steeper moments requiring ice axe and crampons. There were hidden dips in the knuckle of rock leading down from the summit of Carn Dearg. Bottomless powder lurked there. Should I switch to snow shoes? I struggled with the dilemma as my crampon-clad boots floundered in powder drifts one minute, then bit into icy slopes the next. By the time I reached Sgor Gaibhre’s summit I still hadn’t made up my mind. The view was expansive from this scoured and windswept place. 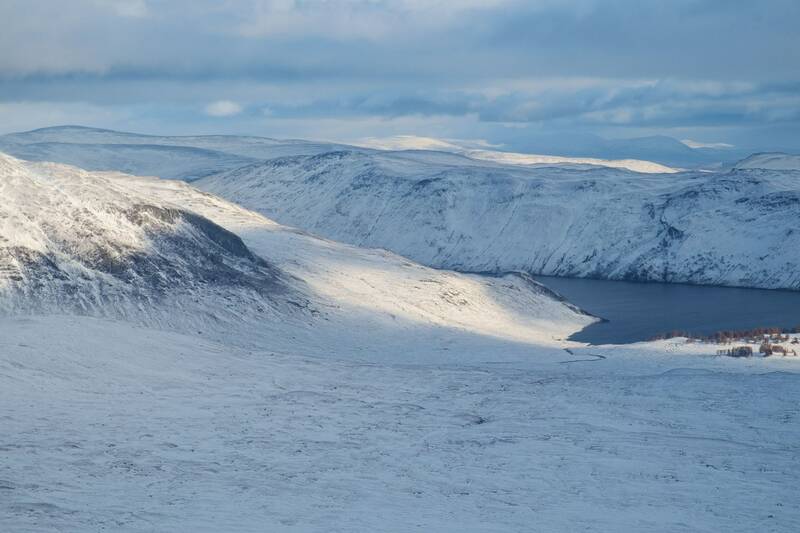 I could see my descent route, down a gully and then across a huge bog to the shores of Loch Ericht. And there, a pinprick surrounded by immeasurable emptiness, I could just make out the gable end of Ben Alder Cottage. The crampons stayed on for a while longer as I negotiated steep, iron-hard ice below the summit of Sgor Gaibhre. These slopes had been swept clear of new snow by the winds, leaving the old névé behind, a trap for the unwary. This was my first outing in a new pair of lighter crampons and I felt the reassuring bite of the heel points as I flatfooted carefully down, ice axe poised, trying to keep the weight of my rucksack centred and balanced. Then came the gully. I’d expected steep ground, but I hadn’t expected a cornice of the softest powder barring my way. What was on the other side? Steep ice, perhaps? I couldn’t tell, and without a rope and a partner I could see no feasible way around. After weighing up the odds, I decided to go over the cornice – carefully. I almost lost my nerve, and was about to pull back from the edge when my crampon punched through the cornice and the snow gave way beneath me. I dropped down with a sickening lurch, but my boots immediately plunged into a snowdrift and I sank up to my waist. Stillness. Opening my eyes and looking around, I could see that I had fallen less than half a metre. The cornice wasn’t as big as I feared, and the slope below me was gentle. A bit of wading would see me to safe ground. But I’d fallen into the classic trap of ignoring the warning signs and my own judgement, and I took a moment to berate myself before focusing on completing the descent safely. The gully was deep and soft. Soon I was able to climb up onto one side and continue the descent on safer broken ground at the base of some crags. All the snow scoured from the summit area had clearly ended up on this side of the hill; I found myself wading, and quickly stopped to change crampons for snow shoes. A little later, the axe went back on my pack and I got my trekking poles out again. As the angle slackened off and the light started to fade, I started to think I had this in the bag. It was all easy from now on. That’s when I placed my snow shoe on a patch of ice that seemed firm and I sank up to my waist in freezing, black bog water. Once I’d managed to drag myself out of the quagmire, I stood there shivering and breathing hard, my waterproof trousers slick with slime. Suddenly the cold really hit me and I had to clench my jaws together to stop them from chattering. You bloody idiot, I told myself, disgusted with my ineptitude. The rest of the descent was tedious. Concealed peat hags forced me to thread a delicate line, often far from my compass bearing. The sun dropped below the shoulder of Sgor Gaibhre. I started to fantasise about a roaring fire at the bothy, but I knew I still had a couple of rough miles left to go. By the time I staggered over the bridge across the burn at the bottom of the hill, snow shoes still strapped to my boots, I was operating on autopilot and an insidious exhaustion had crept into my limbs. It had been a long day. I knew I needed to find shelter quickly. In the end I practically collided with Ben Alder Cottage. My head torch picked out a wall, and the glint of a window. I’d arrived. Maybe it’s because I was worn out and a bit stressed, but this bothy had a good feeling about it from the moment I slumped through the doorway and gazed, stupefied, at the interior. The left-hand room looked like it might be the warmest, and to my astonishment I found a huge pile of firewood next to the stove, several candles, and three half-full bottles of whisky. Bothy heaven! 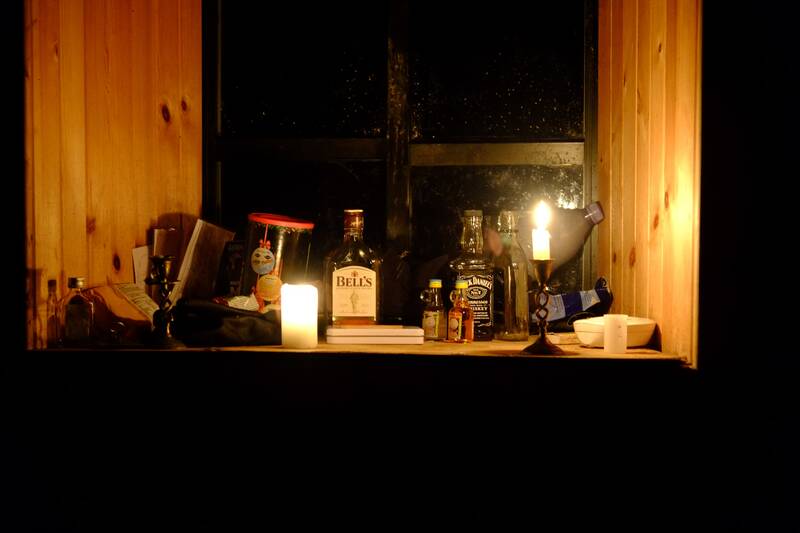 There’s nothing quite as good as those first couple of hours in a bothy after a really hard day out. 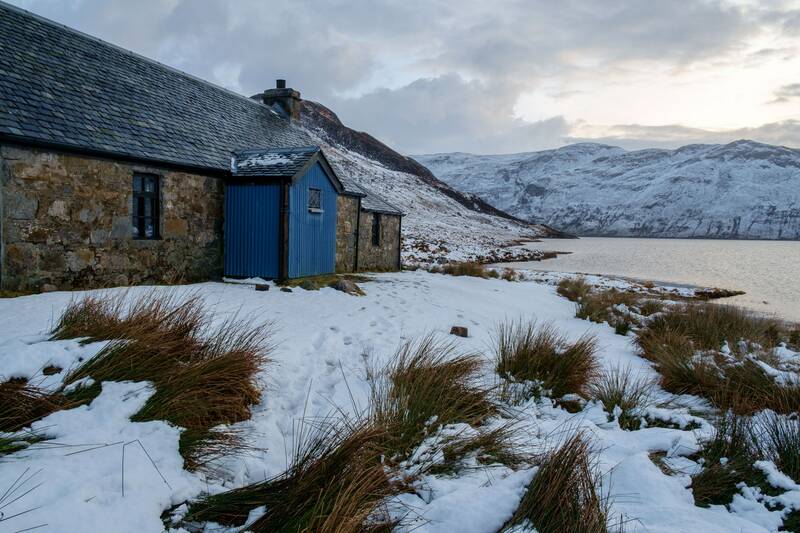 The stove blazed, I had a pan of pasta on the boil, and once I’d changed into my spare clothes and insulated jacket I helped myself to a generous dram of whisky while I flicked through the bothy book. The messages of friendship, gratitude and adventure cheered me even more. After my feast, I slept better than I’d ever slept in a bothy. No spooky night-time noises disturbed my sleep. I heard no mice scurrying between the floorboards, and I felt no sinister presence. When I woke to the red glow of daybreak, the room looked warm, lived-in. If there was a ghost here, it was a friendly one – or perhaps it had simply taken pity on a bedraggled mountain traveller. When I stepped outside the bothy to take a look at my surroundings, it was obvious that a sudden thaw had swept in overnight. The snow pack dripped. Bare ground showed through the slopes high up on Ben Alder. 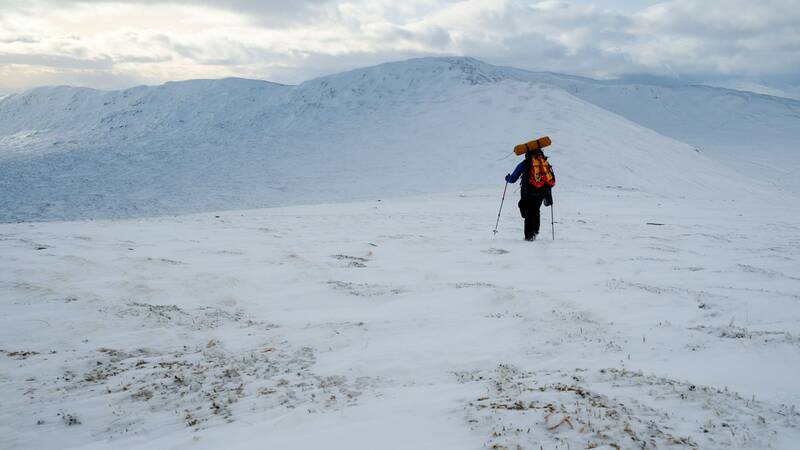 Wary of wet-snow avalanches, I scuppered my plans to traverse the ridge of Munros west from Aonach Beag, and mentally prepared myself for another day of snow-covered bogs as I made my way back to the station at Corrour through the glens. But I didn’t mind. The solitary welcome at Ben Alder Cottage, that beautiful and remote place on the shores of Loch Ericht, made up for any amount of discomfort or disappointment. All images © Alex Roddie 2016. All rights reserved.